The hotel is a fine example of 16thC architecture, initially the home of Henry Roper, head servant of Catherine of Aragon. Beautifully presented & centrally located, the hotel boasts 56 bedrooms, 3 function rooms & the Tudors restaurant. Once on the M25 exit at J28 signposted for Brentwood and take the road off the roundabout, signposted for Brentwood A1023 not the A12. You should now be on Brook Street. Proceed straight through 2 sets of traffic lights. The hotel is situated 200 yards on the right hand side. 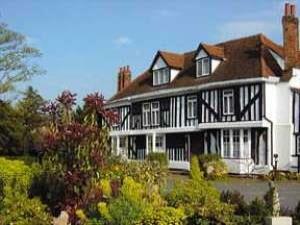 We are a black and white Tudor building set back from the road with a large car park at the front.